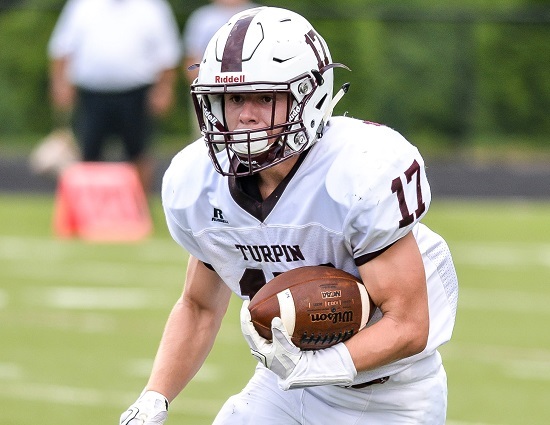 Several Northern Kentucky teams are taking this week off, including Simon Kenton and Covington Catholic, but Cooper visits Dixie Heights and some small schools play critical district games. Plus Greensburg vs. Batesville looks to be one of the premier matchups in the tri-state this Friday. Cooper (4-2) at Dixie Heights (3-2), 7 p.m. – Cooper is scoring 40.2 points per game and is averaging 294.0 passing yards. The Jaguars throw nearly half the time, with Jared Lonaker 104 of 179 for 1,754 yards and 16 touchdowns. Dante Hendrix continues to have a monster year receiving, with 32 catches for 627 yards and nine scores. Jaden Jackson has helped maintain Cooper’s balance in the run game with 114 carries for 716 yards and eight TDs. Dixie Heights snapped its two-game losing streak last week by beating Boone County, 23-12. Its losses have come to Simon Kenton and Conner, two of the best teams in Northern Kentucky, but the Colonels fell by 29 and 32 points in those games. Cooper won by 28 when these teams played last year. Ludlow (2-3) at Brossart (3-2), 7 p.m. – Ludlow has turned its program around the past couple of seasons, going from 1-10 in 2012 to 14-13 since the start of 2014. Justin Blackburn has been the focal point of the Panthers’ offense with over 600 ground yards. Brossart has also had a rejuvenation, but it happened much more quickly, with the Mustangs going 1-8 in 2014 and 9-2 last year. Bryce Donnelly had five TD receptions in his first eight receptions this year as Brossart now throws the ball as often as any small school. These teams have played three straight years, and the difference was nine points or fewer each meeting, with the Mustangs winning, 19-13 in 2015. Scott (1-5) at Harrison County (3-3), 7:30 p.m. – Scott hit the program’s high-water mark both in terms of wins (10) and playoff advancement (state quarterfinals berth) but has fallen off a cliff to start 2016. One bright spot has been David Patrick, who gained 288 through the Eagles’ first six games. Harrison County had a miserable stretch earlier this decade, winning six games in four years including an 0-11 campaign in 2014 but has fought its way to .500 after an 0-2 start. Luke Slucher has been the Thorobreds’ top offensive weapon with 76 carries for 435 yards and five scores. Walton-Verona (3-3) at Owen County (2-3), 7:30 p.m. – Walton-Verona has overcome a disastrous start in which it was outscored, 82-0 the first two games to get its winning percentage back to .500. The Bearcats average fewer than four pass attempts per game, and Scott Pettyjohn leads the team in rushing yards with 309 and three touchdowns. Walton-Verona has held opponents to 262.2 yards per game and just 73.5 in the air. Owen County also got off to a poor starting, beginning the season 0-3 before winning its last two, both by 28 points. Austin Riggs has been a workhorse out of the backfield, gaining 565 yards and scoring 13 touchdowns on 102 carries to pace the Rebels. Greensburg (4-2) at Batesville (4-2), 7 p.m. – Both teams have already lost to Lawrenceburg, so they are chasing second in the ultra-competitive EIAC 3A Division. Greensburg has won four of its last five – all against 4A opponents – and has allowed more than 22 points just once, with that coming in the loss to Lawrenceburg. Batesville won its four four but has lost two in a row to East Central and Lawrenceburg. The Bulldogs were allowing just 10.0 points per game during their winning streak but have surrendered 73 in their losses. Batesville holds a slight 22-18 edge over Greensburg in these teams’ past 40 meetings, and the Bulldogs eked out a 14-9 win over the Pirates last season.